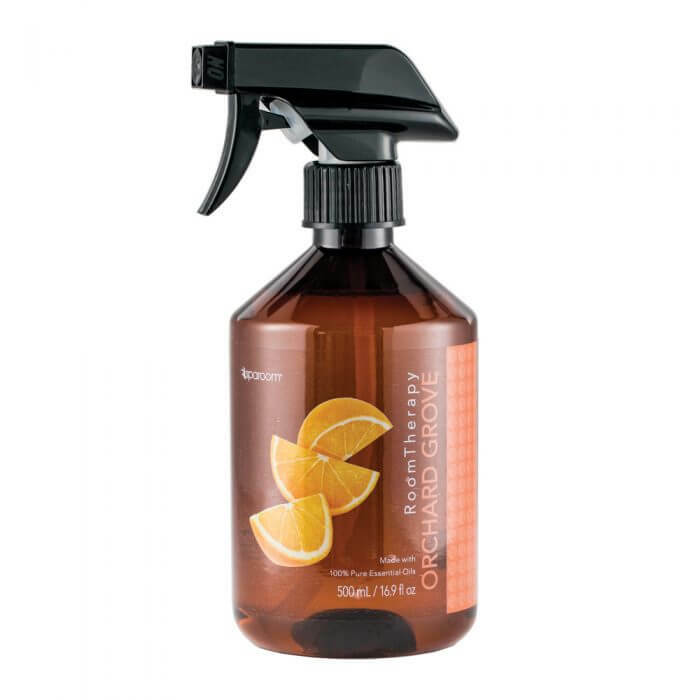 Our Orchard Grove Essential Oil Room Spray provides a sweet medley of fresh fruit and citrus reminiscent of a walk through an orchard. Directions: Hold the bottle upright, pointing away from face and pull the trigger. Sray towards a ceiling fan to increase coverage area. Ingredients: Water, Alcohol and base fragrance blended with Litsea Cubeba (Litsea cubeba) and Orange (Citrus sinensis) essential oils. WARNING: FLAMMABLE. NOT FOR INTERNAL USE. MAY IRRITATE SKIN. AVOID CONTACT WITH EYES. IF CONTACT OCCURS WITH EYES, RINSE THOROUGHLY WITH WATER. KEEP OUT OF REACH OF CHILDREN AND PETS. NOT INTENDED TO BE USED DIRECTLY ON PETS. TEST A SMALL AREA OF FABRIC WHICH IS OUT OF SIGHT BEFORE APPLYING DIRECTLY TO UPHOLSTERY, LINENS OR FURNITURE. INGREDIENTS MAY CAUSE COLOR VARIATIONS.